MAY 2012 VOICE: With national health costs struggling to stay below 100% increases and our state’s public sector critics crying “budget busters”, the Commonwealth’s Group Insurance Commission’s (GIC) FY13 rate increase of just 1.43% has to be headline news. 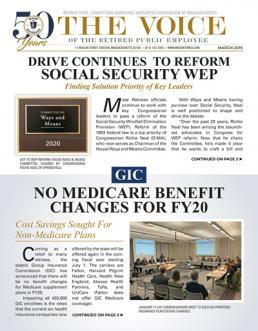 APRIL 18, 2012: For the overwhelming majority of Medicare eligible retirees insured through the state’s Group Insurance Commission (GIC), the insurance plan of choice has long been the Optional Medicare Extension (OME) Plan run by UniCare. Typically, most OME subscribers also include CIC coverage with their basic plan. NOVEMBER 2011 VOICE: In early August, the US Congress and President Obama reached a compromise agreement to raise the Federal Debt Ceiling, as well as cut an immediate $900 billion in federal spending. The compromise also created a 12-member Congressional “Super Committee” tasked with cutting at least another $1.5 trillion in federal spending over 10 years. October 28, 2011 — More prudent use of medical services and tougher competition among healthcare providers has slowed the growth of Medicare spending, allowing for Part B premiums to be lower than projected, federal health officials said yesterday. OCTOBER 28, 2011: The federal government has announced that the standard Medicare Part B premium for 2012 will be $99.90 per month. Under the Medicare program, eligible retirees are responsible for 25% of the total cost of Part B, with the federal government subsidizing the remaining 75%.